Who doesn’t love having their feet washed & massaged? But, did you know the foot contains 26 bones, 33 joints, 107 ligaments and 19 muscles! They Strike The Ground Approx. 10,000 Times Per Day! Authorities on foot health say that keeping an eye on your feet is just as important as keeping an eye on your overall health. Your feet can signal problems with undiagnosed diabetes, cardiovascular disease, kidney disease and even cancer. Think how long your nerves, arteries and veins must be in order to make it to your feet. They are also at the lowest part of your body. Now, think about how hard your body must work to keep your feet happy! Feet are the body’s early warning system. 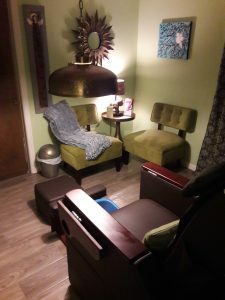 Because of this, Sacred Moments Massage &Healing Center believes it is extremely important to create a one on one relationship with a knowledgeable pedicurist. A consistent second pair of eyes never hurt! By watching your foot health, we can help you catch undiagnosed conditions before they do permanent damage. Finding a problem can give doctors a head start on treating a potential problem. In addition to physical problems, did you know your feet are a storehouse of memories & information? Feet archive all the records & experiences of our entire existence, patterns, conducts, and beliefs. They are a mirror and a real expression of what we are and live. These held patterns are the origin of our pain and suffering and constitute the characteristics of our personality. Maybe that’s why a foot massage feels so good! The art of foot washing is an ancient Mediterranean custom that found its way through the bible into modern time and is mentioned in the book of Genesis at least four times. This custom was not intended for sanitary purposes but more as a compassionate way of seeing to the comfort of someone who had traveled barefoot or in open sandals on hot, dirt roads in order to pay you a visit. Foot washing is a loving gesture that reinforces our common humanity and expresses hospitality in a compassionate and direct way. At Sacred Moments Massage & Healing Center, we strongly believe in the age old custom of Foot Washing. We feel it is an honor. A shared, loving, and compassionate moment between two souls. A time of respect. Washing the feet gives rise to the presence of love, compassion & pureness in one’s heart and the door to self-knowledge, love and acceptance is allowed to be opened. Both for the giver and the receiver. From the dawn of time, foot washing has passed through the hands of many sages & healers. It is a most wonderful and generous gem, worthy of full respect. We would be honored to wash your feet! At Sacred Moments Massage & Healing Center we take caring for your feet very seriously. We use organic/all natural products. Our nail polishes are vegan & are DBP, Formaldehyde & Toluene Free. For the diabetics, we understand you need special care & attention along with products safe and gentle. We also have a special formulated foot soak for the person who suffers with neuropathy. In addition to carefully & lovingly selecting only the best products for our foot care services, we have created a private suite for you to enjoy. No chatting. No cell phones. Only peace and quiet! We encourage you to create a relationship with your nail tech. Your time will be scheduled with her EVERY appointment. Relax in the privacy. The serenity. Make it a time for you to enjoy and have a true healing experience. After all, isn’t that the way a pedicure should be received? Included in your experience, is a trip to our famous Healing Cabinet! Our cabinet contains a vast assortment of all natural ingredients to soak, scrub and exfoliate. You’ll find salts, clays, muds, herbs, oils, flowers, essential oils and more! You choose. You create your experience. 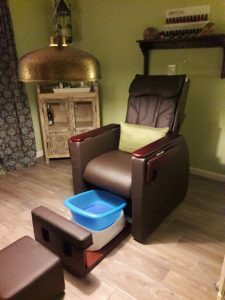 If you are looking for a specific product to help with a foot or health issue, our knowledgeable nail technician/pedicurist can assist you in choosing the best ingredients for your concerns. The next time your “dogs” need a little attention, we would love to help! Schedule a healing foot session and join us in your private suite. Create a natural/organic experience. Enjoy infused waters, herbal teas & treats. Drift away and enjoy a pedicure the way we believe it was meant to be experienced! Therapeutic Himalayan Salts & Himalayan Salt Detox Foot Tiles. Moor Mud. We’ve got it all! Balance your feet and relax your soles as your feet and lower legs are soothed and stimulated by our signature pedicure. Includes an aromatic foot soak, reshapes nail, cuticle detail, callus remover, exfoliating scrub & masque, warm bamboo towels, foot massage and polish. Begin with our pure Himalayan Salt Therapeutic Foot Tiles. Settle in and rest your feet on our Himalayan Salt Foot Tiles specifically designed to detox, ground and ease aches and pains. May be used heated or cooled, depending on your condition. Continue with a Himalayan Salt Foot Soak, Scrub and Massage. Yes, we even use pure Himalayan Salt Stones to massage your calves & feet! Finishes with reshaped nails, cuticle detail, callus remover & polish. Using natural mineral salts revitalizes the body with calcium, magnesium, and potassium. Aching muscles are alleviated and the skin softened as the detoxifying salts draw out impurities. As well, there is enhancement of the respiratory system, allergy and asthma relief, skin purification, and a significant reduction of the effects of a stressful lifestyle. This classic nail treatment shapes, buffs and glosses nails to perfection. Includes a hydrating mask and relaxing massage. Designed to soothe and repair tired hands. We offer all natural pedicures & manicures. Our polishes are vegan & DBP, Formaldehyde & Toluene Free. Reflexology makes use of very precise reflex points. The advanced practitioner can asses the health of the internal organs of the body by working on their corresponding reflex points on the foot, & even work to improve the health of these organs by working the reflex points of the feet, hands, & ears. In Thai Reflexology, the intention is different. As opposed to attempting to assess & address individual areas of “dis-ease”, the Thai massage practitioner’s focus is on balancing & improving the energy flow throughout the body, thereby strengthening the body’s ability to heal itself & return to a balanced, optimal state.